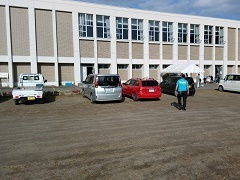 The AMDA team worked together with JRAT (Japan Disaster Rehabilitation Assistance Team) at Shikinoyakata in Mukawacho, and Atsuma Central Elementary School as well as Atsuma Sports Center in Atsumacho. 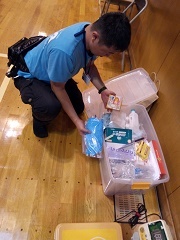 Upon finding out that the public health nurse who was working at Atsuma Central Elementary School was exhausted, it was decided that one of the AMDA nurses, Mr. Yamakawa, would take their place from that evening. AMDA will consider how to continue its activities by discussing with local municipalities and public health nurses. 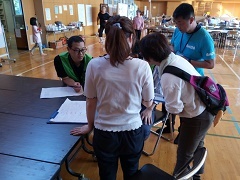 As of 5:00pm on 14th September, there is a total of 1,390 evacuees in Hokkaido, 150 of whom are evacuating at Atsuma Central Elementary School. Although power has returned to the majority of households in Atsumacho, more than 70% are still without running water.